BATMIDAS-P is the acronym for the new high performance portable Windows NT based mono/multi-channel (up to eight channels) ultrasonic data acquisition and analysis system with detection of position based on air borne ultrasonic signals. Real time 1D and 2D display of ultrasonic signals and actual position of the probe allowing the acquisition of co-ordinates without mechanical devices is its most powerful feature. The non-mechanical positioning system is based on a 40kHz ultrasonic transmitter linked up to the UT probe. The 40kHz air borne ultrasonic signal is gathered by three (up to six) receivers located at known positions thus obtaining the time of flight of the mentioned signal. With these data and by means of triangulation techniques the exact position of the emitters in the user selected reference system is obtained with accuracy better than 1 mm. Up to three emitters can be used in order to obtain not only position but orientation of the inspecting probe. In this way, A, B, C and D-scans UT (radio frequency and echoes) registration can be obtained by the in-field manual inspection without the need of costly price and maintenance mechanical positioning systems and with comparable accuracy and repeatability results. The UT linear/mono/multi-channel electronics allow high-resolution inspections, adding large bandwidth amplification, pulse adjustable in frequency and voltage, and 80MHz/8 bits digitisation. Those capabilities meet the main Aeronautic Industry specifications. The whole system is highly integrated and installed on a Portable Industrial PC. 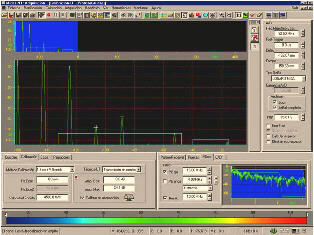 The powerful data acquisition software is Windows based allowing fully controllable parameters of the electronics, easy calibration process, on-line display of A and C-scan of ultrasonic data with actual position of probe, echo-dynamic signal on A-scans, and automatic backup of data without interruption of inspection. The BATMIDAS-P system is conceived for the in-field or laboratory manual and semiautomatic general purpose ultrasonic inspections, pipes and tanks inspection, redundant systems, manual inspection of special composites materials in the Aeronautic, Power Generation, Automotive and other industries in general. BATMIDAS-P is a low-cost, portable ultrasonic mono/multi-channel inspection and data acquisition system designed for manual non-destructive examination. Contrasting to conventional manual inspection systems, BATMIDAS-P provides an spatial register for the ultrasonic inspection, which enhances the defect detection reliability and ensures a larger coverage of the inspected material. The BATMIDAS-P field of application covers many ultrasonic inspections by Non Destructive Testing (NDT) of critical components in several areas of application as nuclear, aeronautical industry, materials characterisation, laboratories, probes characterisation, etc. The hardware and software of BATMIDAS-P has been designed in order to address such versatility and meet a demanding level of performance and functionality without compromising portability. BATMIDAS – P (see Figure 1) consists of a portable industrial computer integrating a 3D positioning device (BAT) and a versatile ultrasonic electronics (by Metalscan). 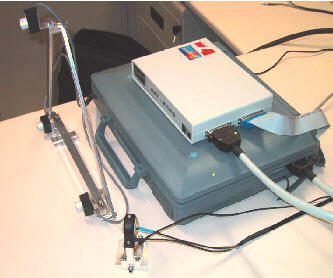 Fig 1: Picture of the BATMIDA-P system, including the portable computer, BAT device, UT electronics, and ultrasonic sensors. BAT is a positioning device that gives the three-dimensional coordinate of a probe (or any other element of interest), as incremental encoder signals, while it is in movement. This device is based on 40 kHz ultrasonic pulses and it doesn't use mechanical components. In a three-dimensional space, the device only requires three receivers, freely positioned in the working zone, and one emitter, next to the inspection probe. In addition, a temperature sensor is used to take into account the small variations that suffer the sound velocity with the ambient temperature. The system provides the three-dimensional position by means of three encoder signals in a Cartesian system. Optionally, coordinates in a polar reference system (for pipe inspections) and orientation angles are available. In this case, more than one emitter (up to four) are used in order to achieve angular coordinates, and more than three receivers (up to six) are available in order to select dynamically during inspection the three most suitable receivers in terms of the instantaneous signal quality. BAT is connected to the portable PC by the parallel port and includes a dedicated software that runs concurrently with the acquisition software. This software, which allows the user to define the appropriate coordinate system by a simple procedure, calculates the position of the emitter from the times of flight detected in the three receivers, sending back the results to the BAT device which generates the encoder signals. The BAT device triggers continuously the UT signal acquisition as new coordinates, with a resolution ranging from 1 to 2 mm, are produced. The minimum time elapsed between two consecutive coordinates is 10 ms, which, according to the sound velocity in air, allows a maximum emitter-receiver separation of 3 meters. If larger distances are required, several BAT units can be plugged in chain optionally. The UT electronics provides a wide variety of parameters to be controlled. The probe can be excited either with negative or bipolar pulses or bursts of 1 – 15 pulses, with a pulse width ranging from 25 to 1250 ns, amplitudes up to 200 V, and different damping impedances (33 – 90 .). The receiving stage consists of a linear amplifier with a gain adjustable dB by dB up to 70 dB, a bandwidth of 20 MHz (at –3 dB), an attenuator of 0 – 40 dB, and a low-pass filter with a cut-off frequency selectable in the 1 – 16 MHz range. Distance-Amplitude Correction (DAC) curves with 31 programmable segments are also included in this electronics. The UT signal is digitised by a flash 8 bits A/D converter at a frequency in the 40 – 80 MHz range. BATMIDAS-P software, called MIDAS, takes profit of the windows environment and multitasking of Windows NT technology. MIDAS consists of three main modules for calibration, acquisition and post-evaluation purposes. The UT calibration module (see Figure 2) allows the user to select and optimise the ultrasonic signals to be recorded during the acquisition, while performing at the same time calibration of the time axis (sound path) and signal amplitude using reference signals from standard pattern blocks. Channel Summary: Table for the calibration conditions, including: Probes used, Field and type of information to be stored, spatial resolution, expected data file size and data flow, expected inspection time, etc..Customisation: Default position of the windows, type of cursors, colours, units, etc. Fig 2: Example of the UT calibration screen in MIDAS. Signal window: Signal scans (both complete and zoomed), UT gates and the DAC curve, if it exists, are displayed with selectable scales from different units. Gate and DAC parameters may be adjusted either graphically or numerically. Along with the signal, it is possible to display the accumulated maximum signal, and scrolls of the echoes detected. Cursors: Amplitude, time and frequency cursors for both absolute and differential measurements in the units selected are available in different modes (local peak, free movement, signal value, absolute maximum, average value, RMS value). Definition of probes: Probe type (Single/Dual crystal), Name, Frequency, Focus, Offset, Skew and Type of Wave(s) generated/received. Pulser/Receiver Control: excitation pulse voltage and width, damping, attenuation, gain, and type of connection to the probe (Pitch-Catch/Pulse-Eco) can be configured. Filters: The low-pass, band-pass and high-pass filters available in the hardware may be numerically and graphically adjusted or disabled. DAC curves: Graphical and/or numerical definition of DAC points. Gates: Beginning, End, Threshold and Maximum number of echoes to be detected. Digitisation: Signal type (Linear/Logarithmic), sampling frequency, beginning of field to be stored, field depth, amplitude offset correction, storage of complete signal and/or echoes only and use of the echo-start technique. FFT: Either Linear or logarithmic display are available. Measurements: Peak value, rms value, offset and DC signal component. Control panel: This includes a series of indicators and alarms which informs the operator about the instantaneous status of the system (activity, data flow, coordinates, etc.). UT window: It is used to monitor the progress of the acquisition in a variety customized windows showing, echoes, the signal Ascan and 2D projections with independent colour scales (both discrete and continuous) for amplitude and sound path. A cursor permits the user to know at any moment the UT information corresponding to any position of these representations. In the post-evaluation module, the user can configure the screen in order to extract the most interesting information from each inspection. This screen can be configured with an arbitrary number of graphic objects including Ascan, FFT, numerical and graphical views of echoes, scroll windows, thermometric indicators (vumeter type) for simple magnitude (attenuation, thickness) representations, 2D projections (C-Scan, B-Scan, and D-Scan) and 3D Views. This system manages two independent palettes, one for the amplitude and another for the sound path in which the user can set up the number of colours and gradation type in 2D and 3D projections. This system also provides different tools such as echoes and geometrical filters, measure cursors and rulers, zooms, boundary, text and identification marks, statistic tools, multi-file evaluation, and printing tools. BATMIDAS-P is a low-cost portable system intended for manual UT inspections. This system, based on a versatile UT electronics and an accurate device for positioning the UT probe in three dimensions, incorporates a Window-NT based software including a number of calibration and evaluation tools with a high degree of functionality. This system increases significantly the reliability and productivity of inspection tasks in manufacture and service of aeronautic/aerospace components.